It's odd how animals know things before we do. Yesterday, our dog Suki showed uncommon compassion for her poultry playmate Pee Wee. This morning, Pee Wee was gone. And Suki watched quietly from the back door, as I carried her lifeless body from Chickenland to a safe place, until we could decide what to do with her remains. Pee Wee has lived on this property on Allen Street almost as long as we have. We bought her little chick self at the Caesar's Creek Flea Market, along with five others that have long since passed on, about a year after we moved here. Ask how long a chicken lives and you will get a dozen different answers. No one seems to really know. But, I can tell you this, at 9 1/2 years, Pee Wee was right up there with the longest-livers I have ever heard of. From that first flock of six, two chicks immediately stood out as the most precocious, Rocky and Pee Wee. Both would go on to cartoon fame on this blog, Rocky as the smart-talking wise-cracker and Pee Wee as the pensive one. 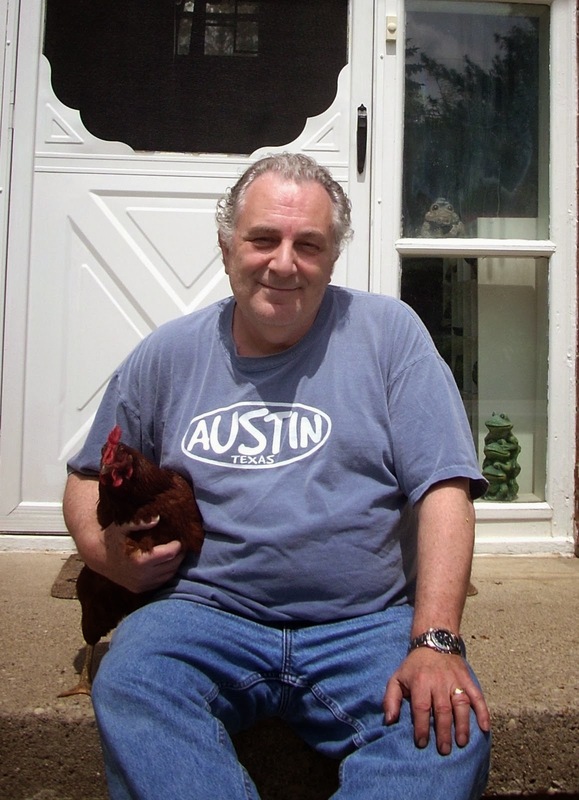 I have to admit that, in those early days, Rocky, a Barred Plymouth Rock, was my favorite. But Pee Wee, a Rhode Island Red, was always there, vying for attention and eventually getting it. While Rocky was always showing off for both family and flock, Pee Wee was working hard to become my best bud. She won my heart, one day, as I was sitting in a lawn chair in the backyard just chillin' with a beer and some chips, watching the chickens hunt for bugs. I noticed she was hanging around the chair, begging for attention. Finally, she jumped into my lap and settled in to share some chips. Pee Wee was old reliable. I could take her out front while we worked in the garden and let her root for worms, without worrying about her getting lost on us. If we brought some young ones along, she would keep them close like an old mother hen. She would talk to me every morning, when I would go out to feed and water the flock. When Suki came along, three years ago, the flock got all nerved up. But, Pee Wee remained stoical. If Suki poked her nose through the Chickenland fence, Pee Wee would peck it. Eventually, we got up enough nerve to let Pee Wee out to play with Suki and the resulting game of hunt-and-peck was always fun to watch (see video). For the past couple days, I noticed Pee Wee wasn't doing too well. She was all puffed up and moving slowly. Yesterday, I knew the end was near when Suki and I were playing Frisbee in the backyard and Suki suddenly stopped and looked over to where Pee Wee was laying all balled up like a pile of reddish-brown leaves. Instead of trying to roust her, as she normally would, Suki walked slowly over to the fence and stood quietly watching her. Finally she turned and looked at me, asking with her sad eyes, "What's wrong with Pee Wee, Daddy?" I went into the chicken run and picked Pee Wee up. Under normal circumstances, that would be a signal for some serious barking. But instead, Suki stood sadly quiet, watching, as I carried Pee Wee around the back of the coop and put her into one of the laying boxes to keep her comfortable. The glazed look in her eyes was one I have seen before - when Rocky died, four or five years ago, she had the same look. I knew that when I would come back for Pee Wee in the morning, she would be gone. Suki knew it, too. Rest in peace, Pee Wee. You were a good friend. You will be missed.